The functional principle of a resistive pressure transmitter is very simple. The pressure sensor converts the mechanical pressure value into a proportional electrical signal. The pressure sensor typically consists of a stable main body and a (thin) diaphragm. 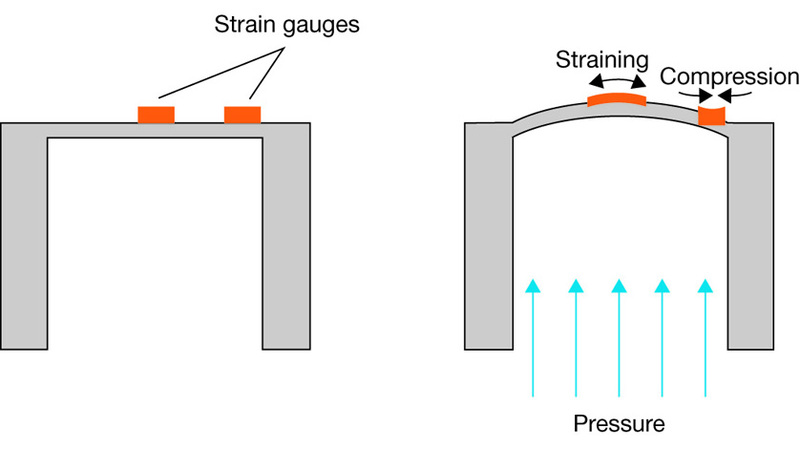 The diaphragm is the most important element for the measurement of the pressure and is equipped with strain-sensitive and compression-sensitive resistance structures, so-called strain gauges (DMS). The diaphragm is deflected under the influence of pressure. Please find additional information in the trade article “Introduction to pressure measurement“. More information on this topic can also be found in the book: Eugen Gaßmann and Anna Gries: Electronic Pressure Measurement – Basics, applications and instrument selection; Süddeutscher Verlag onpact GmbH; Munich 2009 (Volume 323 of the series “Die Bibliothek der Technik” (library of technology). Electronic pressure sensor/pressure transmitter or mechanical pressure indicator?